The European Central Bank interest rate decision put EUR under pressure along with the political uncertainty in Italy. 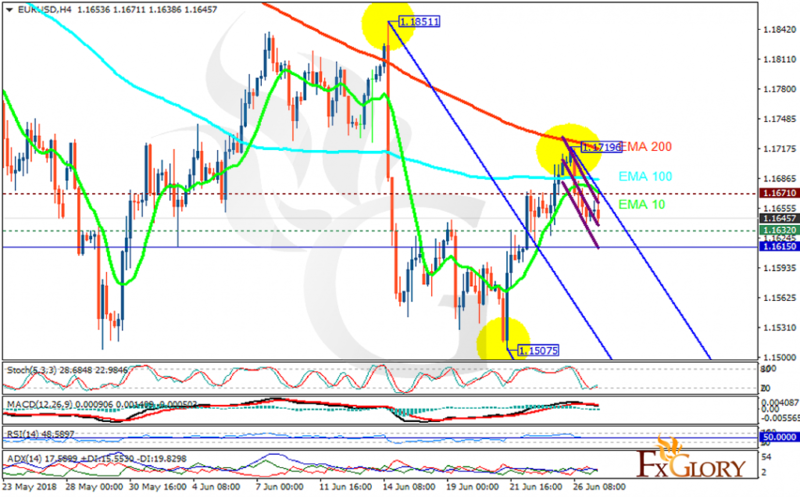 The support rests at 1.16320 with resistance at 1.16710 which both lines are above the weekly pivot point at 1.16150. The EMA of 10 is moving with bearish bias in the descendant channel and it is below the EMA of 200 and the EMA of 100. The RSI is moving on the 50 level, the Stochastic is moving in low ranges and the MACD line is below the signal line in the negative territory. The ADX is not showing any clear signals. Most probably EURUSD will continue its decline within Andrews’ Pitchfork while keeping 1.15 the floor.